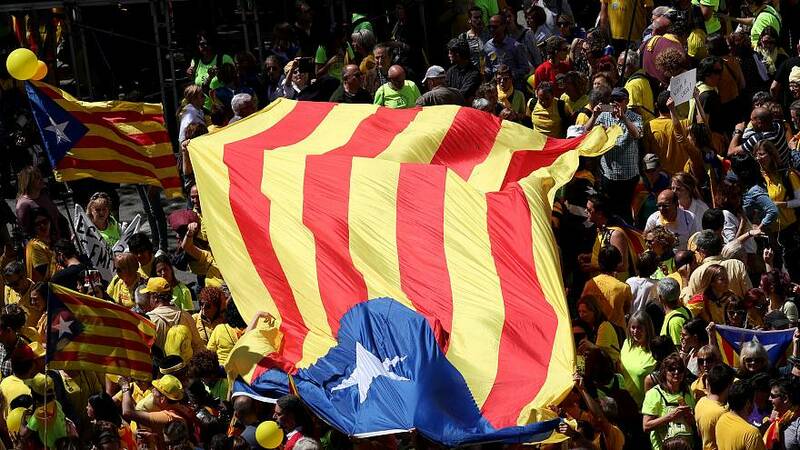 Tens of thousands of supporters of Catalan independence took to the streets of Barcelona on Sunday calling for the release of jailed separatist leaders. The demonstrations come after a Supreme Court ruling prevented the latest attempt to appoint a regional leader. The protesters blocked several main thoroughfares in the city waving flags and wearing yellow in support of the jailed leaders. "We are a peaceful movement, but it is clear that we need to go further; taking out the toll barriers on the highways is just a way to protest, so we will keep taking out the toll barriers, cutting off roads or access to create a disturbance. This is how you achieve things." "TheNational Catalan Assembly aims to put pressure on the political parties and the Committee for the Defence of the Republic makes it clear at street level that they can bring the country to a standstill if they want." The protester's appetite for independence is equally matched by the national government's determination for Catalonia to remain part of Spain. The Catalan Assembly has until May 22 to invest a president. If that deadline is not met then the region could be forced to call fresh elections within two months. Among the politicians facing charges of rebellion is Jordi Sanchez, the latest candidate put forward by Catalan lawmakers to become leader of the region. Supreme court judge Pablo Llarena refused last week to release him from jail and he faces up to 25 years on charges of rebellion, marking the latest of four unsuccessful attempts to elect a new leader.